Russia’s worst drought in a decade will probably generate losses for bondholders as food prices rise and the government may be pushed to tap debt markets for funds to support farmers. 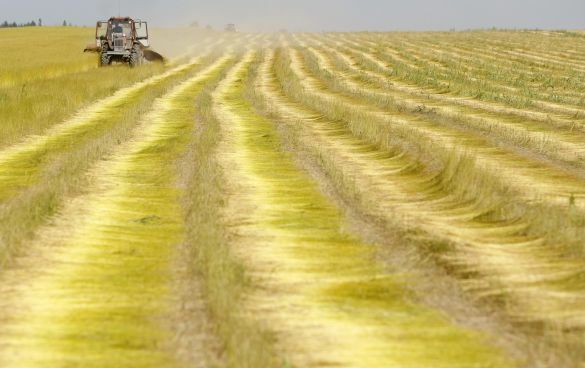 High temperatures, which rose to a record 37.4 Celsius (99 Fahrenheit) yesterday in Moscow, have damaged 32 percent of land under cultivation and forced Russia to declare states of emergency in 23 regions. Grain prices may double this year because of the drought, according to the Grain Producers’ Union. Inflation may quicken to 8.1 percent by the end of December, compared with the government’s annual forecast of 6 percent, according to Yaroslav Lissovolik, Deutsche Bank AG’s head of research in Moscow. That will put pressure on Bank Rossii to raise its benchmark rate by year-end for the first time since December 2008, said Natalia Orlova, Moscow-based chief economist at Alfa Bank. Higher rates “may cause a correction in short-term sovereign bonds and, later, in long-term sovereign bonds,” said Evgeniy Nadorshin, senior economist at Trust Investment Bank in Moscow. The government, which plans to sell 1.2 trillion rubles ($39.3 billion) of bonds on the domestic market this year to finance its budget deficit, may increase that figure to pay for subsidies and contain the drought’s fallout, Nadorshin said. So far, the government has been reluctant to pay more to sell its debt. The Treasury last week failed to sell 30 billion rubles of federal bonds, known as OFZs, due July 2015. At a subsequent auction the same day, it sold 11 billion rubles of notes due January 2013, compared with the 15 billion rubles planned. The average yield was 6.28 percent. A week earlier the Treasury sold 11 billion rubles of 2012 notes at 5.92 percent, falling short of the 20 billion rubles offered. The government has signalled it may pay higher rates as it floods the market with debt. Deputy Finance Minister Dmitry Pankin said in a July 19 interview the treasury “may offer a premium” over secondary market rates at this month’s auctions. Yesterday’s temperature in Moscow was the highest since Russia began keeping records 130 years ago, according to the website of the Hydrometeorological Monitoring Service. The previous high was 36.8 degrees in July 1920, during the Civil War. The temperature may rise to 38 degrees on July 29, according to Gidromettsentr, the state weather service. Russia, the world’s third-biggest wheat exporter, will harvest about 80 million metric tons of grain this season, 17 percent less than last year, according to Moscow-based researcher SovEcon. Grain prices rose as much as 33 percent last week on drought concerns, SovEcon said on its website. Drought is likely to have a bigger impact on prices in Russia than in other countries, Orlova said. Food accounts for 38 percent of the consumer price index in Russia, compared with 15 percent in the U.S. and 32 percent in China, Alfa estimates. A domestic economic recovery also may encourage retailers to pass on higher grain prices to consumers. Unemployment fell 0.5 point to 6.8 percent last month. Retail sales grew an annual 5.8 percent and have risen every month this year. “This intensifies inflationary risks and justifies our expectations of higher inflationary pressure in the second half,” Orlova said. Pavel Skurikhin, head of the Grain Producers’ Union, said higher grain prices won’t lead to a “spike” in the cost of bread. The cost of grain accounts for no more than 15 percent of bread prices, he said in an e-mailed statement. Prime Minister Vladimir Putin’s administration may try to limit inflation by releasing grain from storage or curbing exports to distance itself from Russia’s history of volatile prices, said Chris Weafer, chief strategist at UralSib Financial Corp. in Moscow. The inflation rate reached 120 percent in 1999 after Russia defaulted on $40 billion of domestic debt, and prices rose more than 2,000 percent in 1992, a year after the fall of communism. The inflation rate fell to a record-low 5.8 percent in June, the statistics office said July 5. Last year’s record 7.9 percent economic contraction allowed the central bank to cut its benchmark 14 times to a record low 7.75 percent in May as demand eased and price increases slowed. “August will be the decisive month” for the interest-rate outlook as the inflationary impact becomes clearer, said Julia Tsepliaeva, head of research at BNP Paribas in Moscow.